This subdivision in the website listings is called Central Catalonia because this region is in the geographical center of Catalonia, with easy access to all of Catalonia's major attractions. Barcelona is an hour to the south, Girona and the Costa Brava are an hour to the east, Tarragona and the theme park of Port Aventura are an hour to the south, and the Pyrenees are at at your doorstep, a few kms to the north and northwest. Largely agricultural, this area is only just recently emerging as a destination for foreign travelers, although Barcelonan weekenders have been occupying houses here year-round for many years now: in winter because it is close to the ski-slopes, and in summer, to get away from the heat on the coast, and in Spring and Fall as that´s when nature is at its best. The towns here are not as rich and not as well-kept and touristy as those of the Costa Brava, where for example, many municipal ordinances require even new constructions to glad outer walls with stone so as to preserve a (false) appearance of antiquity. (I'm all for it, by the way!) The villages in this area are not as spectacular. 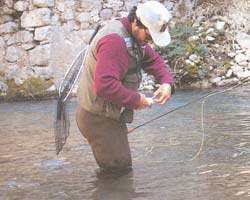 However, Central Catalonia has plenty to offer the holiday-maker, and you can have a very satisfying vacation without even leaving the area. No, this isn't the Costa Brava or the Costa del Sol. It has no recognizable "denominacion de origin" that is familiar to tourists around the globe. But the houses here are magnificent. You will not find houses like these - large and beautifully restored 17 and 18thC farmhouses, tastefully decorated, with private pool, etc.... on the Costa Brava for anything like these prices! The money you save or the better quality of the house might more than make up for the extra driving on day trips to better known spots, and anyway, many of you are coming to get to know Catalonia - all of Catalonia. For that, staying in a central location could be ideal. All the houses under this heading are situated in one county, or comarca, called el Berguedà, named after the pre-Pyrenean mountain range which starts at the comarca's capital city, Berga. (Autonomous states in Spain are divided into provinces, and provinces into comarcas, like the departements in France. The Catalan autonomy has four Provinces, and 42 comarcas.) 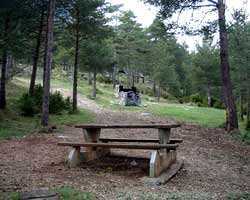 El Bergueda occupies the northernmost part of the Province of Barcelona. 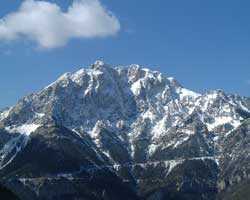 An agricultural region since pre-historic times, it is an area with a distinct topography and history. It's modern history is largely defined by the river which runs through the middle of the comarca to Barcelona. The Bergueda along the Llobregat river was the first area in Spain to be industrialized back in the mid-19thC, with textile factories and mines constructed along the riverside. 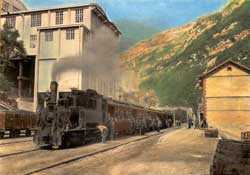 There is little if any mining or textile work being done now, and the factories and the colonies that once housed the workers, many of them built in a uniform art-nouveau "modernist" style, have been turned into tourist attractions and museums. These "colonias" were veritable purpose-built villages, with factory, workers living quarters, church, etc, all built in the same harmonious architectural style, often overlooked by the industrialists magnificent mansion perched at a safe distance from the hoi polloi on a nearby hilltop. Some of the workers quarters are now being renovated and sold to Barcelonans eager to have a pied-á-terre in the foothills of the Pyrenees. Once you get away from the riverside, you climb into lush hilly farmlands, mostly dairy farms, separated by forests of pine and holm oak. A striking feature of this region are the strange and capricious shapes of the enormous boulders and rock outcroppings that form many of the hilltops. They look like something from of the holy land, and add an extra element of drama to what is already spectacular scenery due to the high mountains that hem you in on all sides, the ever present Bergueda to the north and west, Montserrat to the south, and the Sierra del Montseny to the east. 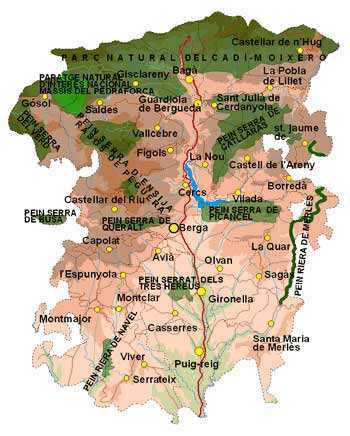 The capital, Berga separates the comarca into Alt (or high) Bergueda and Baix (low) Bergueda. 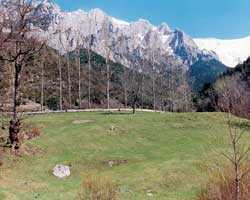 The Alt Bergueda is very mountainous and scenic - a must see for all travelers to this area. 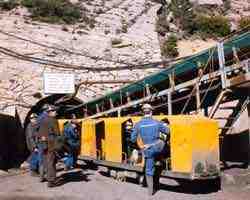 But getting there and back can involve some fairly strenuous driving. That is why I have chosen to represent only rental farmhouses in the Baix Bergueda, all of whom are situated on pristine farmlands with easy access just inland from the Llobregat and the C-16 highway that snakes along side it. To get to the main tourism office, entering from the C-16 there is a very well-stocked Tourism Office a on your right just before the exit for Berga Sud. In Berga you have another office. Upon entering into Berga, go straight, past the shopping center, past the hotel Estrella, and when you reach a widening of the road and the plaza, turn right onto Serafi Pitarra, and park where ever you can, as the office is just ahead on carrer (street) Barcelona # 49, on the third floor, take elevator. Tel: 93 821 3553. But they have many of the same brochures and maps at a small and easy-to-reach tourism office just off the main road, the C-1141, at kilometer 75, where the is also a bar and a large parking lot. Tel: 93 822 1500. 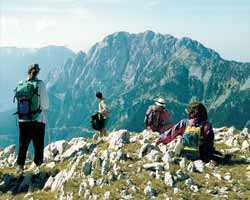 The best tourism info center for hikers and mountain bikers is in the town of Baga, up the C-1411 by the tunel del Cadi, el Centre d'Informacio en Baga, on carrer la Vinya 1 (93 824 4151). entioned earlier, Catalonia's most famous tourist attractions are not in the Berguedá. There are plenty of guidebooks which can tell you about the major towns, like Barcelona, Girona, Tarragona, and the major historic sites, like the monasteries at Santa Creus, Poblet, or Sant Pere de Roses, or new attractions like the Port Aventura theme park. 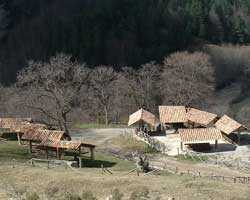 Even closer to the Berguedá are important historical sites such as the towns of Ripoll, Vic, Cardona and Solsona. 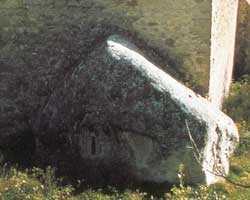 However, as other guidebooks cover these well-known sites, I will limit the scope of this guide to only the Berguedá. Most of the Berguedá's main sights are in the mountainous Alt Berguedá, but I will begin in the Baix Berguedá as most of you will be staying in houses near Gironella (pronounced Gee-ron-ey-ya) and Puig Reig (which locals pronounce as Po-rrei, almost like porridge, but you might want to pronounce it correctly as Puge, as in refuge, and Reg, as in the first part of the name Reggie. These two towns are just 7 kms apart on the main road, both are quiet agricultural towns with an old quarter separate from the new, a convenient main shopping street, and some decent restaurants. The church of Sant Marti in Puig Reig has well-preserved 13thC murals in situ, as does Sant Andreu in nearby Cal Pallot, though it's the neo-Gothic church of the factory owners that gets in all the postcards. The town boasts one of the area's best restaurants: El Celler de Ca la Quica, (93 838 0202), where a good Catalan meal will set you back about 40 Euros. When you walk in, the owners will lead you down to the atmospheric wine celler, pour you a glass of house wine, show you a choice of wines which you can choose from for your meal, and then it's upstairs for a look at la carta, which they also have in English. More popular restaurants in Puig Reig include el Baixador for midday menus of about 8 Euros, all included, or Cal Marcal (93 838 0396), on a curve after the gas station on the road leaving Puig Reig towards Manresa, where I had a very satisfying 4 course lunch for 7.50 Euros. Cal Marcal also has a little shop with organic fruits and veggies. Be careful crossing the street here! The butcher shop called Ramaderes de Montanya del Berguedá on Puig Reig´s main street (carrer Llobregat) specialized in ecologically produced meats. Just off the C-16 south of Puig Reig is the Museu de la Colonia Vidal, an early-20thC textile colony where you can see how the river was diverted to turn steam turbines, along with the huge cotton dying rooms, the worker's housing, schools, etc... Guided visits on Saturdays and Sundays at 11 am. Daily at same time in August. A few kms to the west of Puig Reig is Casserres, where three of our larger rental properties are situated, a sleepy agricultural town with one nice old street, Carrer Major, just below the town's over-sized Church square. 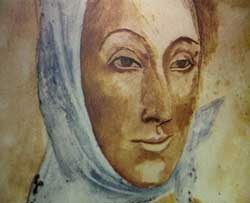 Romanesque Santa Maria de Casserres has some original frescos and an impressive barroque alterpiece. Fonda Alsina is very popular locally for its generous 4-course menus of about 8 Euros, both lunch and dinner. Go prepared for a good meal but also prepared to wait for it. The waitresses are local girls who seem to have their minds elsewhere. But the food here is so good and cheap I don't mind the wait or even oily smells that waft out of the kitchen. There is a good bakery on main street, and the town market is on Thursdays. Beyond Casserres is the lovely little hamlet of Montclar, a cluster of hilltop stone houses which have been lovingly restored by their mostly Barcelonan owners (but some foreign owner's too), who have formed an exceptionally nice little community with no fences between houses, well kept lawns and trees, and there is one tiny restaurant. With no name, this is one of those humble country inns, which, aside from the TV set that diners huddle around at communal tables, looks straight out of a Dickens novel. Open Sat and Sun lunch and dinner only. Don't miss the dried out circular reservoir next to the church. 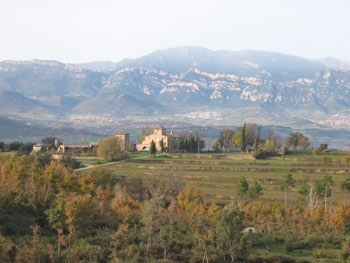 South of Montclar is Viver i Serrateix, an area inhabited since neolithic times, the hilltop 10thC monastery of Santa Maria de Serrateix affording great views of the Sierra de Montserrat to the south. 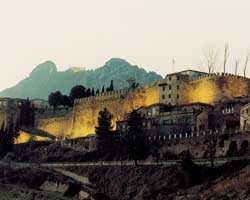 Beyond Serrateix is the large medieval town of Cardona, with its famous Parador-castle. Between Casserres and Serrateix is the Alzina dels Cells, a huge oak tree that has been declared a national monument. I measured it circumference at about 37 meters. North of Casserres on the road to Gironella you'll across the reservoir of Sant Pau, set in a pine forest, a scenic spot where you can admire some of those rock outcroppings I mentioned earlier. On the other side of the reservoir, next to 12thC Sant Pau de Casserres, there is a quite simple and pleasant restaurant overlooking the waters where I had a good meal of canalones and civet of wild boar. I'm told nobody goes to this restaurant and it is true that when I was there, we were a total of 3 guests in the dining room which must seat well over 100. But I took advantage of the situation and moved my table over closer to the fireplace and enjoyed a memorable meal. If, before reaching the restaurant, you turn north towards Avia (with its attractive Romanesque churches, including 12thC Santa Maria, with great frescoes, ask for key to get in next door) there is another curious little hamlet at Grauges. Turn in when you see signs for Bar del Llac. There, to the right of the restaurant Cal Garreta, (where I had a good if somewhat frugal 3-course midday menu of soup, roast lamb, dessert, and wine for 7 Euros) is an odd sort of tourist attraction. The folks at Bar del Llac (93 822 0956, or 666 253 953) stuff the scenic lake with trout and for about 2 Euros per person, you are welcome to fish for a day. They also have horse and pony rides, and if there is enough demand, there will fire up the BBQ and serve huge plates of grilled meats for very a modest fee. I have been told the owners of the Bar del Llac are thinking of buying some Quads to rent out. Gironella, like Puig Reig, has grown to nearly 5,000 inhabitants, and has the look of a fairly prosperous agricultural town, with the main shopping street and a little park stretching along the Llobregrat below 14thC Santa Eulalia and the partially walled old town. The shopping street is just perfect: a modern supermarket - Llobet, several bakeries, butchers, fruit stands, a flowershop, and a sprinkling of restaurants and bars. El Celleret (93 822 8259) has a friendly owner, Pepe, serves good midday menus for about 8 Euros, and at night offers, among other things, meats (lamb or beef) served on piping hot slabs of slate, called carne a la llosa. 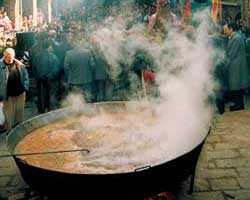 The idea is to let you cook the meat to desired tenderness and eat hot. The road east out of Gironella towards Vic, the C-154, starts just after the new bridge. 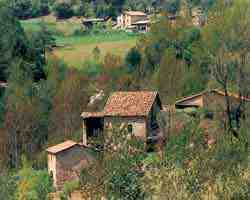 This area east of Gironella is dotted with historic sites. 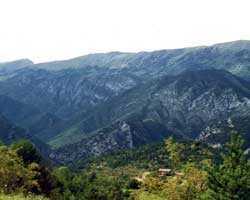 An excursion I particularly enjoyed was through Sagàs and Sant Maurici, climbing steadily higher through thick forests and logging country, to the monastery of Santa Maria de Quar. Originally dating from the 16thC but sacked during the Civil War, Sant Maria de Quar is at the top of a sheer cliff face several hundred feet high, which can be reached by car around to the back. Though there is little left of romanesque Santa Maria, the views are fantastic, and it´s fun to watch the preditory birds who live on the rock face below. This is a great place for a picnic, as is the next stop... A few kms beyond Santa Maria, you come across something you really expect to find out here in the middle of nowhere, the ruins of 12thC Sant Pere Portadella, an important center for religious learning, with a huge church and medieval defensive tower, and lots of ruined outbuildings which would have housed the monks, the libraries, the refractory, etc. The road from the C-154 ends here, and you either have to make your way the 10 kms back to the main road, or if you have a four-wheel drive, you can take the road to the right, leaving Sant Pere, which goes back towards the C-16 near Berga. Another enjoyable drive involves turning north from the C-154 at the Riera de Merles steam, there at the huge three-star campground, and driving up to Borredà and to the magnificent church at Sant Jaume de Frontanyà. Hiking paths pockmarked by wild boar hoofs criss cross the area, and you can make your way down to the Merles stream to the east. Olvan has 13thC Santa Maria de Valldaura, Sagas has 11thC Sant Andreu, La Guardia has a Baroque sanctuary, and Santa Maria de Merles has two old bridges and two 11thC churches. If good eats is what you are after, there are a few good restaurants well worth recommending. For those of you with guidebooks, the two which should be listed are Michelin two-star rated Hostal Llucanes, costing well over 40 Euros per person. Still further east, another Michelin-rated restaurant, Fonda Sala de Olost, offers a highly reputable and economical midday menu, as well as special all-inclusive menu degustacion, also for about 40 Euros. If its cheap peasant eats you are after, Santa Eulalia de Puig Orriol's ramshackle Cal Penyora is supposed to have good homegrown chicken dishes, and in Prats, Fonda Santiago, in the hotel dining room, has a decent midday menu for 8 Euros. However, for top-quality cuisine there is a new restaurant, Els Casals (93 825 1200), just off the C-154 to the right after the left-turn for Sagas, which everyone is raving about, including very favorable reviews in Barcelona's daily, La Vanguardia. (Charlie adds in December 2007 - 3 years after writing the bulk of this text in 2004 - El Casals has been awarded a star by the Michelin Guide!). Els Casals is owned by formally-trained chef Oriol and his wife Marta, and offers creative variations on traditional Catalan cuisine, including plenty of fresh fish dishes. The Vanguardia article, entitled "Solid and sophisticated cuisine de autor" highlights their homemade sausages, homegrown fowl, duck filled canelones, black rice, oxtail stew with cod, baked lamb, or jarret calf stew with their special "buffet" potatoes. There is also an excellent choice of wines, and plenty of delicious home-made desserts. The article suggests you go with plenty of time to enjoy your meal. Reservations a must. Price approx. 30 Euros per head not including wine. Closed Sundays night and all Mondays. (Be sure to mention me or my guidebook so that I can maybe weasel a freebee from the owner´s one day!). 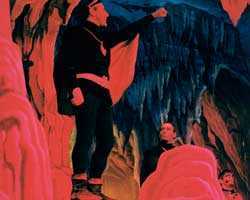 - How to get to Els Casals. From Gironella, 9 kms towards Vic on the C-154, and just after the Km 41 marker, there is a right turn for Els Casals, and you will see the restaurant after 300 meters on your left. If you are to believe the brochures, the once-walled town of Bergá has been inhabited for over 8,000 years. Paleolithic remains were recently found in mid town - so move over Jericho! Be that as it may, little remains of Bergá's past thanks to the spectacular rise in population since the industrial boom of the late 18thC, when the walls were taken down. Currently, the population is well over 14,000, and as you can see from the outskirts, they are still building like mad. But once you have made your way through the 'burbs, the center of town offers some nice old streets and plazas. There is a lot of literature available at the tourism offices on Bergá so I'll be brief. 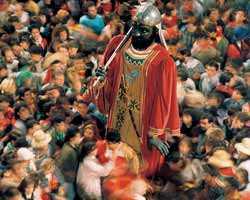 - Patum, on Corpus, 40 days after Easter, a rowdy affair named after the sound of the drums, a complex symbolic choreography of angels and monsters of mixed sacred and profane origins, with people packed in tighter than sardines and lots of pyrotechnics. Not for the faint hearted! - Berga hosts a summer theater fest in August. 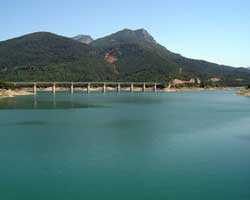 Estany Clar, (93 93 822 0879) in fact out of town, just off the main C-1411 highway, on your right, just after Bergá. The fanciest in the comarca, 50 Euros p/p or more. La Sala, on Passeig de la Pau (93 821 1185) is almost as expensive as the above, but I'm told the quality has gone down. Frankfurt de Bergá on the Passeig Industrial. I usually don't recommend "Frankfurts" but this place has good tortillas and sandwiches. San Marc is perched above Bergá on the road to Sant Llorenc de Morunys, and has simple and cheap midday and Friday night menus, and great views. The dining room of the Hotel Queralt at the top of the Passeig de la Paz has good menus, day and night, at 8 Euros. All day: La Tosca, near bus station at top of Paseo de la Paz on left. A pleasant surprise. Menphis is not only the best discoteque in town, it is the only one in the entire comarca! Casa Guitart on main street, or carrer Ciutat, has good pork products. La Cuina, heading out of town on the road to Solsona, just after the military barracks has excellent cheeses and cold cuts, and some prepared dishes like a French traiteur. Bergá's best known monument is the Queralt monastery, perched in the mountains directly above town, pictures of which adorn many of the comarca's tourist publications (and the Central Catalonia homepage in my website). Known as Catalonia's balcony for the tremendous views, the 18thC shrine of "Our Lady of Queralt" houses a Romanesque polychrome wooden sculpture of the Virgin, which in fact was found at the site of the beautifully preserved 12thC Sant Pere de Madrona, just below the newer shrine. There is a bar/restaurant next to the shrine, picnic areas on way there, and the road up there passes part of Bergá's 16thC fortifications and what's left of the Sant Ferran castle. Queralt is well worth the visit! Beyond Queralt is the Province of Barcelona's only ski resort, the Rasos de Peguera, with cross country skiing and ith peaks reaching 2,300 meters. For downhilll skiing better make your way up to the next comarca to La Molina or to Andorra or Font Romeu in France. For those of you interested in horseback riding, there is a good club situated just below Sant Queralt, called Club Equestre Vilaformiu. 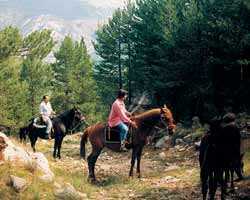 With about 15 horses to rent out at about 14 Euros per hour, Vilaformiu offers relaxing excursions of an 1, 2 or 3 hours throughout the gorgeous Queralt mountains. 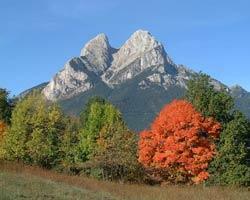 The views are spectacular and the forest itself is beautiful. This club is better for beginners or less experienced riders, as they won't let you gallop up the mountainside with their very well trained horses. Call Bernat, who speaks English, at 608 23 25 23, or his mother, Neus, who doesn't speak English, at 93 821 2121, to make reservations. Minimum two people, preferably more. Highly recommended for the whole family!! How to get to Vilaformiu: pass Berga on the main C-1411 road and after the tunnel, take a right exit for San Llorenc de Morunys, taking the next left towards Sant Llorenc, and after 1 km, turn right at sign for Vilaformiu. 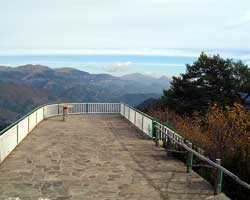 It is 3 kms of curves uphill, with increasingly impressive views, to Vilaformiu. 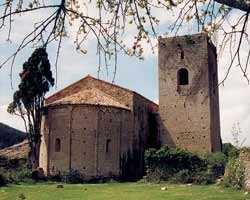 Also near Bergá, on the other side of the C-1411 is the important pre-Romanesque sanctuary of Sant Quirze de Pedret, dating from the 9thC set in an idyllic setting, with picnic areas with barbecues provided, and plenty of trails for hiking. To get there, take exit for Bergá centre, and follow the Cami de Pedret from the Plaza Guernika, passing by the gorgeous 14thC Pedret bridge. 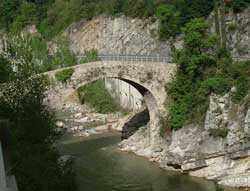 Just above Bergá the C-1411 has a righthand turnoff for the C-149 to Ripoll, crossing a modern bridge over the large reservoir of Baells to reach a cluster of four well preserved medieval villages. Vilada, with 12thC Santa Magdalena de Gardilans, offers good access to the reservoir for swimming, and there are a couple of windsurf and kayak rental shops, (and I've even been told there is water skiing here but I'll believe it when I see it). Perhaps the most reputable of these adventure sports companies is Moli de Cavaller, with canoes, horses, bike rental, routes by off-road 4x4's, paint ball, spelunking, etc. 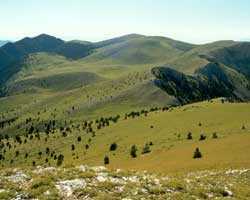 (93 872 62 74 or 608 941 568) The hills above Vilada are crisscrossed with hiking paths. Cal Massana is an excellent bakery, with wood burning oven. Next town up is Borredà, with one of the area's most attractive old town centers, including an arcaded town square. 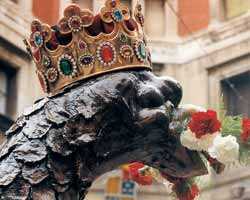 Restaurant La Parada (93 823 9162) has typical Catalan cuisine, including trout and grilled meats, at reasonable prices. 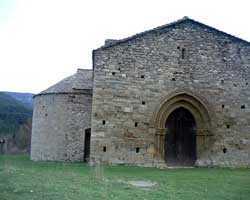 Perhaps the Berguedá's finest example of a Romanesque church is in Sant Jaume de Frontanyà, locally famous for being Catalunya´s smallest village. I don´t want to help spoil a good thing so suffice to say that at detour to Frontanyà, especially at about lunch time is well worth the trip. Above Frontanya there is about 10 kms of slow unpaved road to la Pobla de Lillet, an interesting village, with its crumbling old town, a handsome medieval bridge, a few art nouveau buildings, and above town (and unfortunately just above a smelly paper recycling factory), Antonio Gaudi's Jardins Artigas, a quick drive or a two km walk out of town. 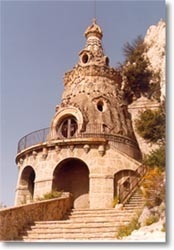 Well worth the visit, this picturesque fantasy park of capricious stone shapes dates from 1905. The park is often closed, but the fence is fairly easy to get around (don't tell them I told you to do it!). For those of you would like a good hike, just below Lillet on the road following the Llobregat back to the C-1411, is a left-hand turn for Falgars and the well-marked 8 km trail to the mirador de Roca de la Lluna Sanctuary, (or panoramic view of the Moonstone Sanctuary). 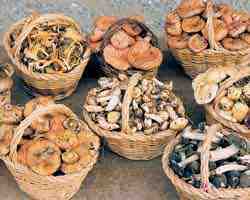 Lillet celebrates a popular fresh mushroom collecting festival on the last Sunday of September. Between Lillet and the next village, Castellar de n'Hug, is 12thC Sant Vicenc de Rus, with partially restored original frescos in situ. Castellar is a well-preserved if somewhat touristy village which is famous in Catalonia for being the birthplace of the riu Llobregat. 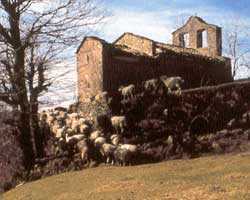 Castellar has a important Contest of Sheepdogs, Concurs International de Gossos d'Atura, held the last Sunday of August. Though I've never been, I always make a point of watching this event on Catalan TV. It is fascinating and the shepherds competing are from all over Europe! Castellar is also home to el Museu de Transport de Catalunya (93 825 7113, with over 170 antique vehicles of every description, including locomotives, trams, and even a old Dodge school bus. Visits on Sundays from 11 to 14h only.) Fiesta Major on 24th June. From Castellar, you can continue north towards Puigcerda and the ski and summer sports resort of la Molina (delta, grass skiing, mountain bikes, ballooning, etc.) or on to Ripoll in the Province of Girona to see the magnificent Cathedral portal, and then on to the equally magnificent monastery church at Sant Joan de les Abadesses - but that is another province.... and another guidebook of mine. Back to the comarca del Berguedá. From Poblet de Lillet, follow the lovely riverside road back to the C-1411 and Guardiola de Berguedá, where the riu Llobregat joins the riu Bastareny. 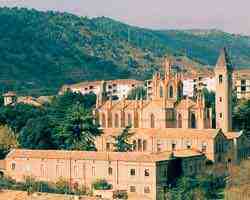 Above town towards Baga is the impressive 10thC Benedictine monastery of Sant Llorenc prop Baga, where classical music concerts are held in August as part of Guardiola's summer festival. The medieval center of Baga, one of the area's best kept, has an arcaded square and town walls dating from 1223. 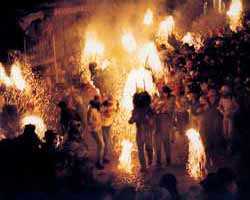 Baga celebrates its Fiesta de Fia-Faia on Christmas Eve. On your way back down towards Bergá, at km 91, there is right turn for Cercs and Sant Cornelli. Cercs is home to a fascinating museum of the mines that uses multimedia and a train ride through 450 meters of subterranean galleries to show how the miners lived and worked. Closed Mondays except July and August, 10h to 19h, about 5 Euros. Above Cercs, in the colony town of Sant Cornelli, is restaurant Santa Barbara (93 824 9209) renowned for their enormous portions of simple grilled dishes at reasonable prices. Cercs celebrates Fiesta Major the second Sunday of May. The bus leaves from in front of: Ronda de Universidad number 11 - 13, in front of the Bosch bookstore, between Balmes and Plaza de la Universitat, about 100 meters from Plaza de Catalunya. Plaza de Catalunya is Barcelona´s main transport hub, and there are blue "Aerobus" that leave from in front of all three airport terminals directly to the Plaza every 20 minutes (about 3.50 Euros per person, about a 20 minute ride in). From where the Aerobus leaves you, walk across the large square to the opposite upper corner, (big hotel and Catalunya metro stop there) and take that street, the Ronda de Universitat, to the bus stop in front of the Bosch library at number 11-13. Couldn´t be easier! Barcelona to Puig Reig (8 Euros) and Gironella (9 Euros). Pay the driver directly. Monday through Friday: 09:15, 11:00, 14:15, 17:30, and 20:00 hours. Saturdays: 09:25, 11:00, 15:00, and 20:00 hours. Sundays: 11:00 and 20:00 hours only. This subdivision in the website listings is called Central Catalonia because this region is in the geographical center of Catalonia, with easy access to all of Catalonia's major attractions. Barcelona is an hour to the south, Girona and the Costa Brava are an hour to the east, Tarragona and the theme park of Port Aventura are an hour to the south, and the Pyrenees are at at your doorstep, a few km to the north and northwest. Largely agricultural, this area is only just recently emerging as a destination for foreign travelers, although Barcelonan weekenders have been occupying houses here year-round for many years now: in winter because it is close to the ski-slopes, and in summer, to get away from the heat on the coast, and in Spring and Fall as that´s when nature is at its best. 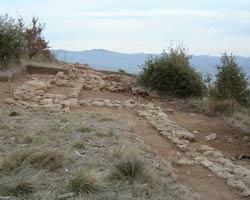 The towns here are not as rich and not as well-kept and touristy as those of the Costa Brava, where for example, many municipal ordinances require even new constructions to glad outer walls with stone so as to preserve a (false) appearance of antiquity. (I'm all for it, by the way!) The villages in this area are not as spectacular. However, Central Catalonia has plenty to offer and you can have a very satisfying vacation without even leaving the area. No, this isn't the Costa Brava or the Costa del Sol. 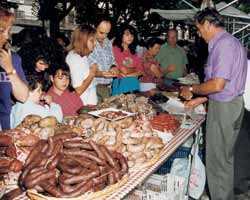 It has no recognizable "denominacion de origin" that is familiar to tourists around the globe. But the houses here are magnificent and very well kept, mostly by the matriarchs of the different families who own the houses. Some of these houses are somewhat less expensive than similar houses on the coast. The money you save or the better quality of the house might more than make up for the extra driving on day trips to Barcelona or the beaches, and anyway, many of you are coming to get to know Catalonia - all of Catalonia. For that, staying in a central location could be ideal. And lastly, for those of you who just want a great house and stay put pool and barbecue-side, this area will have better weather, fewer tourists, and a more than adecuate infrastructure, meaning roads. shopping, restaurants and cafés, activities, sites and sights, etc.. to have an excellent week or two holiday without even leaving the immediate area around the house!